But this is really all about you! Tempnet Permanent and Temporary Recruitment have been supporting their clients across various industries with recruitment services and solutions for almost 20 years in and around the Northern Beaches – Sydney CBD – North Shore & North Ryde. 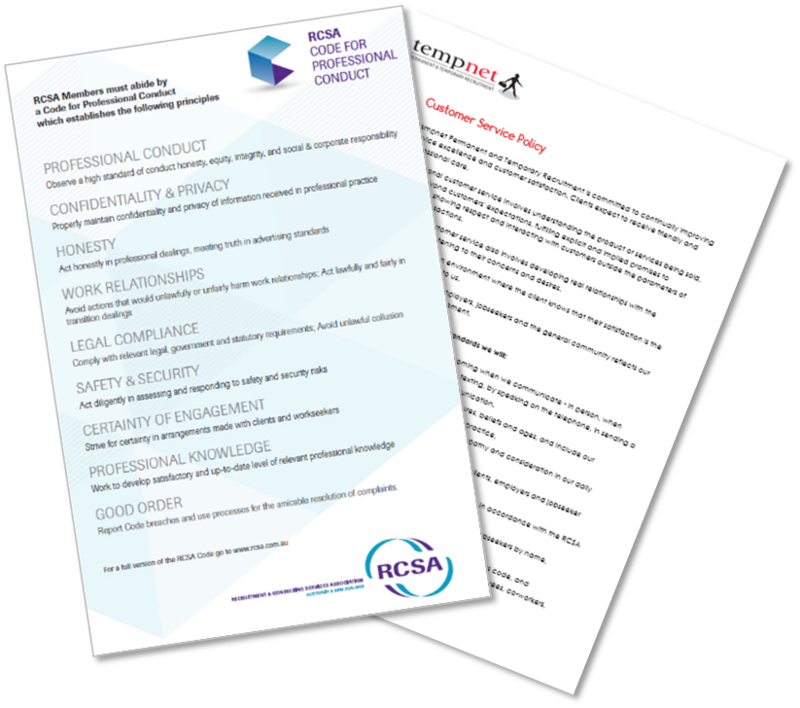 Tempnet are proud to have been an approved Corporate member of the Recruitment and Consulting Services Association (RCSA) since 1998. Why Use an RCSA Corporate Member? Whether hiring a new employee, finding a temporary or contract worker, or searching for a new job, you need to be assured that the company you are dealing with is taking the issue as seriously as you are. Legal compliance, issues of work health and safety, issues of corporate and candidate privacy and the importance of a strong, proven recruitment process are all needed to ensure that not only is the candidate right for the job, but the job is right for the candidate. The benefit of using a recognised recruitment and on-hire company is in the breadth of knowledge and experience that they can bring to your recruitment process. ‘’People’’ are part of our business and we are inspired every day knowing that we can support small, medium and large organisations by providing an all-round stress-free recruitment service! Not only do we build stronger relationships with our clients, we’re always looking for new and innovative ways to deliver our services, and exceed expectations. We work to the philosophy “We deliver your future”by providing businesses with high quality, qualified candidates to ensure that your business flourishes with great people who have been matched to your job specification. We take pride in the knowledge that some of our original placements continue today in their roles after 15 years. We believe that great things can come in small packages and will adapt to the changing needs of our clients offering flexibility, tailoring services to what you require and that we can provide to you. We understand businesses change and budgets don’t allow spending for a full end to end recruitment service. We know that you can DIY and whilst recruiting yourself, there may be parts of the recruitment process you wish to outsource to us and so that we can undertake the final touches for you. We offer you alternatives! With separate support services which you may select individually or bundle depending on your needs. We offer temp to permanent arrangements and payment plan solutions. We can provide a wide range of support and efficient recruitment services and work in the background for you and with you. We take pride to ensure a continued high level of customer care, communication and customised recruitment support focusing on local people for local business. We maintain our honesty and integrity and aspire to exceed our client’s expectations. Whatever your needs and wants, Tempnet can customise flexible recruitment support services for your business. We are 100% Australian and independently owned and operated. Contact your Tempnet for more information on individual recruitment services and staffing requirements. Work with awesome people who love and believe in what you do.